A roof truss consists of one or more triangular units constructed of straight pieces that are connected at the ends by joints. The triangular shape of the truss adds stability and support by distributing weight away from the exterior walls. Timber roof trusses may be used in commercial applications, but they are generally used for residential construction. Timber truss roofs may be hidden or visible, depending on the design plans. 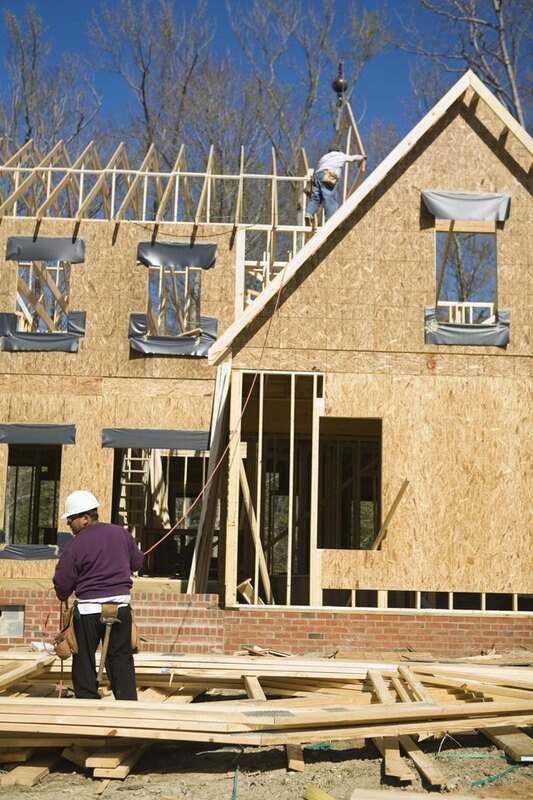 Timber has advantages and disadvantages when used in truss construction. Timber roof trusses provide an environmentally friendly alternative. A truss uses 40 percent less timber than traditional pitched roof construction methods, according to MiTek Truss Fabricators. The timbers used to construct a truss are smaller in dimension and span greater distances. On the downside, timber is subject to rot or warp, especially if exposed to the elements. Wood attracts insect invaders, such as termites, and is more likely to suffer damage during violent weather or high winds. Cost is one of the greatest selling points for timber truss roofs. Timber is generally less expensive than steel. Prefabricated truss roofs negate the need for storage buildings or extra onsite carpentry space, according to MiTek. They save time and reduce labor costs, waste and work site loss associated with pilferage. Timber roof trusses provide an advantage over steel roof trusses when it comes to design options. Timber roof trusses often complement a building theme, such as a cathedral ceiling in a church, for instance. Wood Solutions notes architectural trusses are often oiled, painted, stained or left in their natural state to create a high visual impact. Moreover, timber roof trusses allow for personal preference in the design process because they are suitable for many building types. Steel trusses are generally used in commercial applications for both functional and safety reasons. Steel trusses are not subject to rot and decay like wood trusses and they hold up better in severe weather. However, for fire safety, wood trusses may provide an advantage. Most house fires reach 700 to 1000 degrees Fahrenheit while burning. Steel begins to weaken at 230 degrees Fahrenheit; wood, however, does not ignite until it reaches 250 degrees Fahrenheit. At 700 degrees Fahrenheit, steel loses the majority of its strength; wood develops a coating as it melts. Roof Truss Design notes wood trusses are less likely to burn because "the interior of the timber remains cooler than the unprotected steel."